It starts with the buzzing of flies. The smell of rotting meat. Then the whispers begin. They’re out there, waiting for a moment of weakness so they can slip through, hungry for the vices that feed them. You can even let them in — though be careful of the cost. 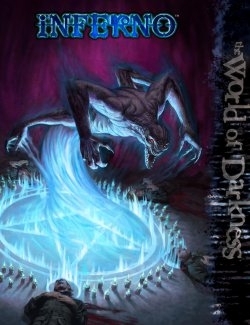 • A resource for portraying demons in the World of Darkness, from spirits of evil to the Hierarchies of Hell. • Information on summoning and pacting with demons. • A system for representing those who have been possessed by the infernal. • Sample demons and possessed to plague a chronicle, demonic artifacts and more.